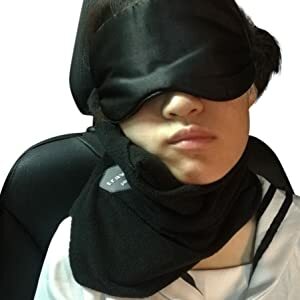 ✅PROVIDES PERFECT NECK SUPPORT for you to get totally comfortable and fall asleep. 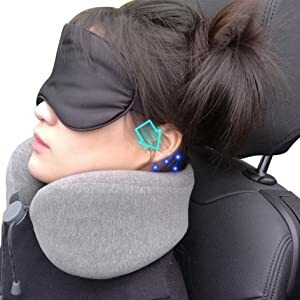 Scientifically designed for sleeping while seated without getting stiff neck. 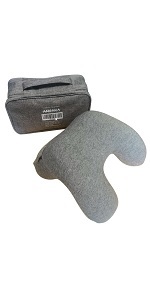 ✅PROVIDES THE BEST 360˚ SUPPORT simultaneously to the chin, neck, and head, softly support your neck in a better way than any other travel pillows. 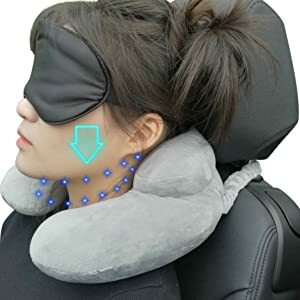 ✅THE BEST INFLATABLE TRAVEL PILLOW - Adjustable for the best fit; Excellent for those with long necks. ✅THE SMALLEST TRAVEL PILLOW - Can be deflated and packed into the included case that is as small as your palm. 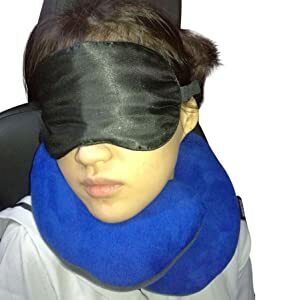 ✅SOFT HYPOALLERGENIC FABRIC - The neck pillow uses a unique soft touch design for your skin; Small fiber particles are deposited to create the allergy-proof surface.We are confident you will love our travel pillow, but if you are not 100% satisfied, you can return it for a full refund – no questions asked. Sleeping while leaning over causes stiffness, especially over long periods. These solutions do not provide comprehensive support to the head from all angles. Lack of support causes the head to overly tilt, leading to soreness and difficulties sleeping. 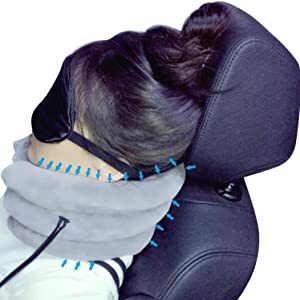 Support of the lower back of the head is crucial for falling asleep comfortably. Full 360-degree support of the head, from the chin, neck, and lower back of the head. Adjustable for the best fit. Especially great for those with long necks. It works best when the seat is reclined, such as on airplanes. However, if the seat does not recline at all, it is also great if worn backward.Full frontal support prevents the head from falling forward, making it the BEST PILLOW FOR SLEEPING FULLY UPRIGHT. 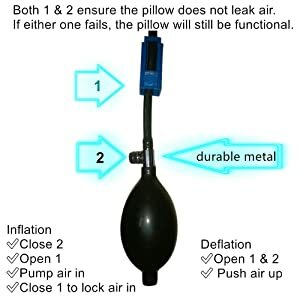 Both 1 & 2 ensure the pillow does not leak air.If either one fails, the pillow will still be fully functional. Based on customers' reviews, the twist-valve was upgraded from plastic to durable metal.